This is a picture of the property when we purchased it. 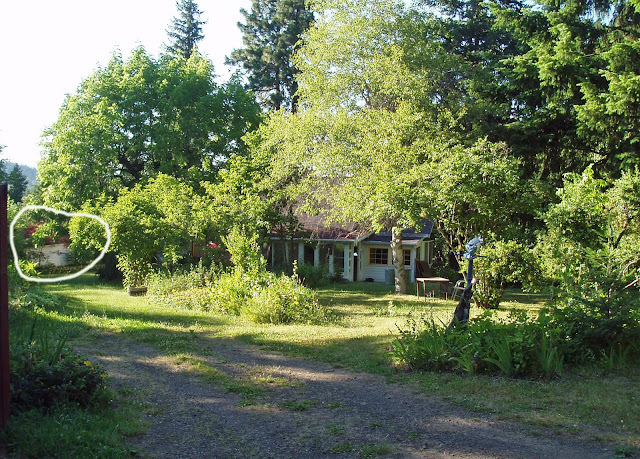 Buried in the overgrown yard was a little outbuilding (which I've circled) that the previous owners used as a sauna. This was the desert phase of our remodel! 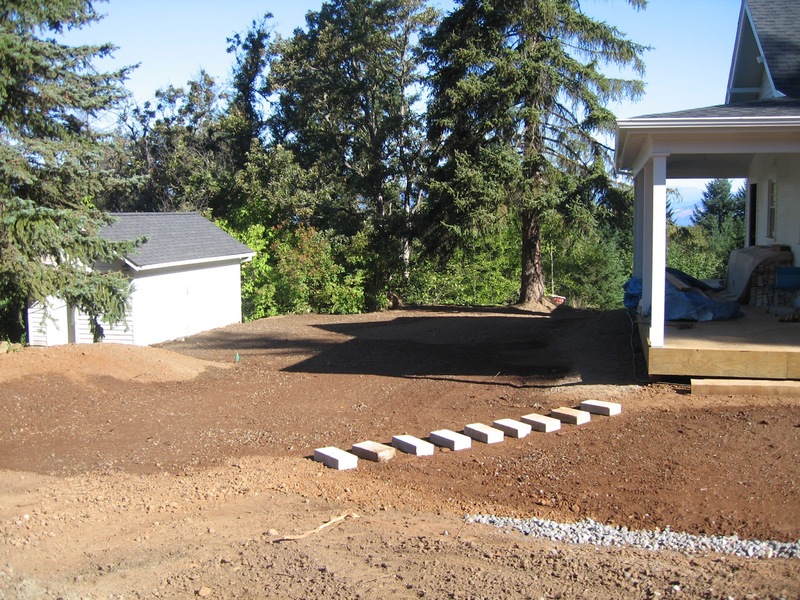 The renovations on the main house were mostly complete by then, leaving the arduous task of bringing the yard back to life. Here it is after we seeded the grass. I also had just planted an Endless Summer hydrangea under the little window. This is a closeup of the front facade, before we renovated the interior. You can see inside the old sauna here. This is one of those projects that will probably be ongoing. But it's looking a little happier since we installed a new wood door (the old door was a hollow core laminate version from the 70's). Thanks to so many of your suggestions, we loved the idea of installing a Dutch door but it was out of our price range (over $1,000). So we went with a wood-paned door from Simpson (the same company that made the rest of our doors), which was less than $300. We also removed the metal awning, which highlights the building's desperate need of a fresh coat of paint (the ongoing part...). The front bed has an Endless Summer hydrangea and a climbing clematis. We planted a mature boxwood on the corner for some winter color, and a hedge of Limelight hydrangea along the side. In the top photo, you can see an Incrediball hydrangea at the left of the frame. There are three Penny Mac hydrangeas to the left of the Incrediball (out of the frame). The Limelight are very happy here. They were transplanted from a front bed by the house, where they received too much sun for their liking. Here they enjoy a mix of sun and shade. 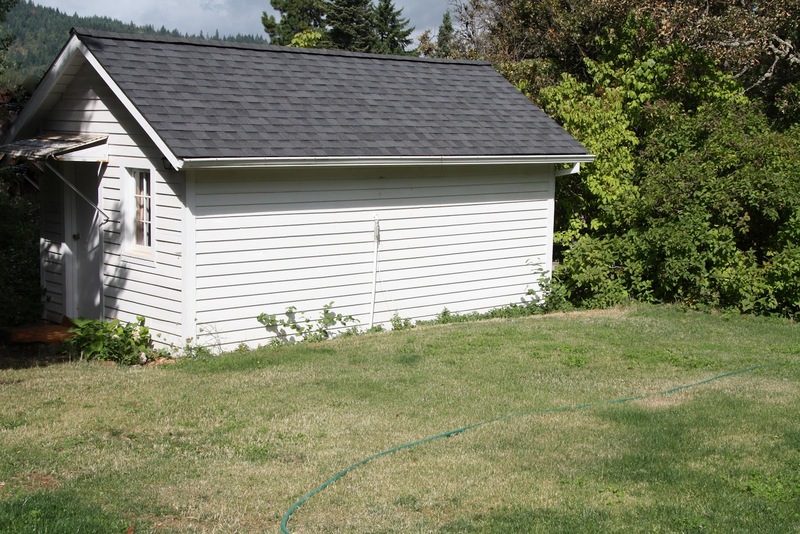 We're so glad that we had this little outbuilding shingled when we re-roofed our house. It was one of those spur of the moment decisions that paid off - otherwise who knows how long it would have taken us to get around to it! It looks amazing! You've done an amazing job!!! I love it! I would love a retreat like that in my backyard. Your hydrangeas are gorgeous! Beautiful! Hydrangeas are my favorite flower and yours are gorgeous! This little out building looks like a sweet little guest house. I can't remember what you use it for...is it a guest house? You'll have to do a post about the inside now! So pretty! Love the flowers too. Great job! Gorgeous, gorgeous, gorgeous. What a fun outbuilding. lucky you!! Since I'm relatively new to your blog, I wonder what you plan to do with The Sauna? Love the new door Trina, it's perfect! And all the flowers really look beautiful with their greenery against the white...you both did a fabulous job! It is great to have a small retreat away from the house and it looks so pretty. How do you use it? We have a tiny summerhouse and we use it for storage as we dont have a garge, but now I'm thinking perhaps I should make it into my little beach house? Reminds me of a little bungalow/shed at my now deceased Nanna's house. She had beautiful flowering sweet peas running up the sides. Your's is gorgeous with the hydrangeas. Job well done! Just beautiful..is this a guest cottage? The flowers are just breathtaking. So charming! 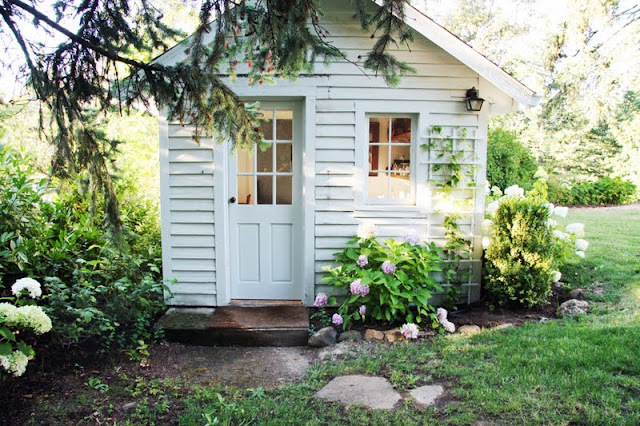 And now I am wishing I had an adorable little outbuilding like that too! I love that shade of white. We have a treehouse in need of some painting. Can you share the color? Our flat roofed carport has a storage room behind it I'm thinking of turning into a craft studio...one day...no pretty shingled roof though but my garden does abound in endless summer hydies! Wonderful! Does it serve as a little gust cottage? Very pretty with the new door. Your hydrangeas are beautiful. A lovely little retreat. 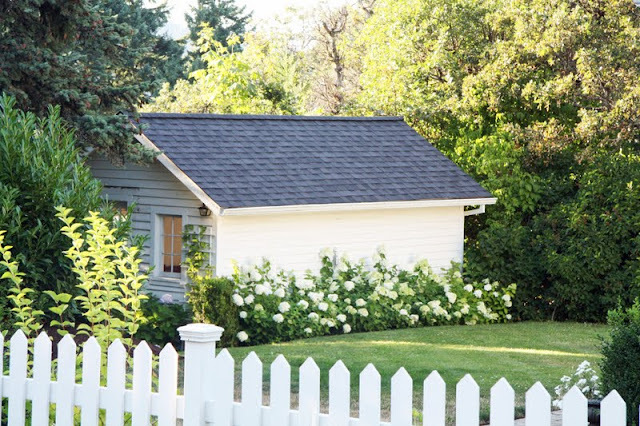 So very beautiful - what a cute cottage it is! I love your hydrangeas as well - they accent it perfectly! So beautiful! I can picture the twins playing in there in the near future!! It would make a lovely little art/reading room for them. Totally charming...adore the limelight hedge!! It looks lovely. Those hydrangeas are so beautiful. Can't stop looking at them. It is so lovely- fresh and simple! I love the plantings you chose and door is perfect. I enjoy this blog so so much!! Perfect little outbuilding! You did a great job sprucing it up. The plantings really make it feel inviting; if you didn't say it's a sauna I would assume it's a guest cottage! So quaint, I love it. Your home and gardens are really beautiful! Once again Trina, just a beautiful post of the hard work you all have done. Looks absolutely beautiful, I wish I had something so quaint and unique to fix up and enjoy! Our guest house is above the barn and one day, I'll get around to posting on that! It looks absolutely beautiful. I love how the white glows near the lime green and background of green grass. Lovely like the author of the blog. It looks just great really sweet and pretty..all the new plants...Happy Monday.. It's absolute heaven over there. :) Every project just gets better and better. I can see that being the perfect playhouse for those sweet babies one day. Beautiful. That last shot is magic. it's a charmer! love the new door, and of course;) all the hydrangea! 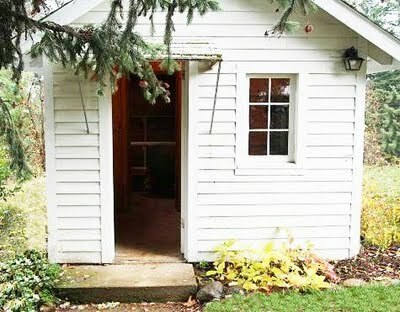 The cutest little shed I have seen in years. The plants are just perfect. So pretty! Do you know what you are going to do with it? Keep up the good work! -and thank you for always sharing. 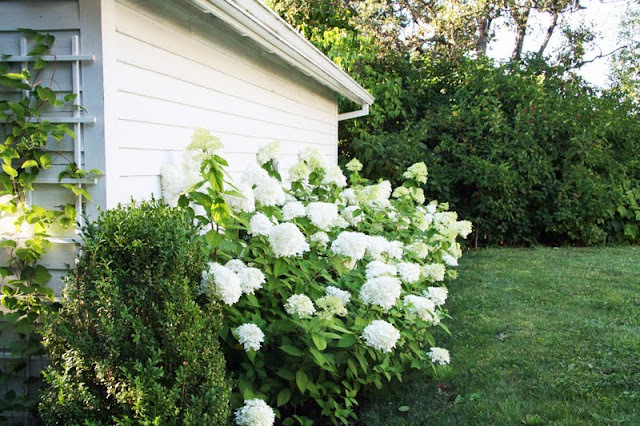 I also love the cottage, and also especially the hydrangea!!!! (do you have any tips or advice on growing them?) I am going to have to get myself some limelight ones!!! This cottage looks lovely - how big is it? Your hydrangeas have inspired me to plant more. 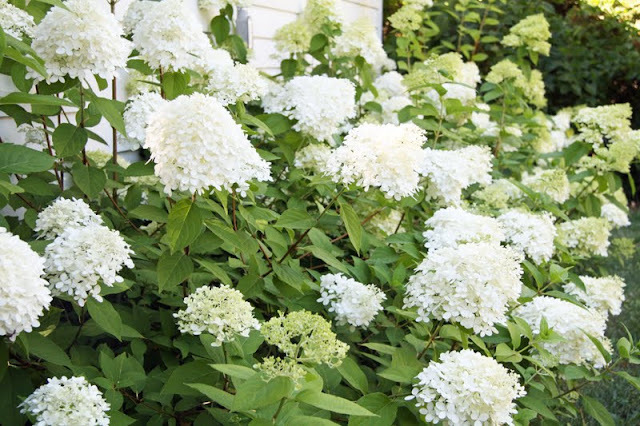 Here in Georgia, I attend the Penny McHenry Hydrangea Festival in Douglasville, every June, named for the woman who founded the American Hydrangea Society. Beautiful garden tours feature all types of hydrangeas. Your Penny Macs are named in her honor. Penny passed away in 2006, but the town still benefits from her energy and enthusiasm for this beautiful plant.